January 2 – January 3. As we motored towards the anchorage, I saw black spots on the beach. â€œIs that them?â€ I wondered in anticipation. As we got closer, they came into focus, ancient stoic faces, bitter hides of scales, lolling dewlaps, thorny ridges traveling down spines to the end of extended tails. Scattered on the sand, unconcerned with the circus of boats and tourists, soaking up the warmth of the day under the blazing sun, were the reason we came to Allenâ€™s Cay, Iguanas. 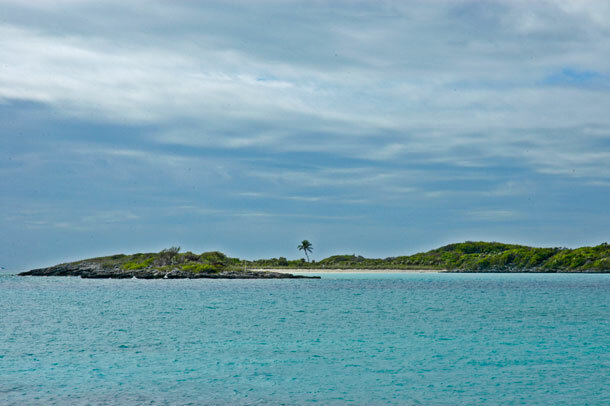 The area of Allenâ€™s Cay where the iguanas reside is actually three cays, Allenâ€™s Cay, Leaf Cay, and SW Allenâ€™s Cay. 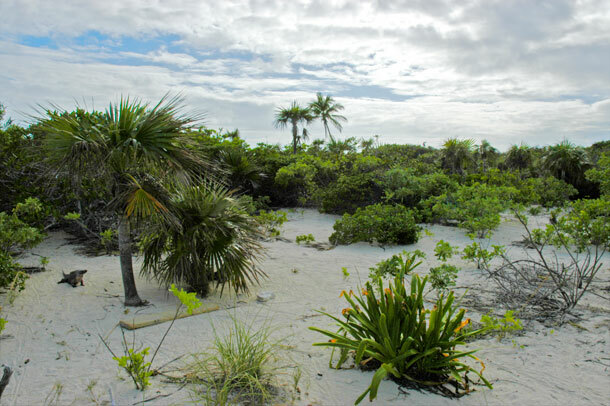 This island group is not far from Nassau and next door to a nice marina, making the endangered Rock Iguana of the Exumas a popular attraction and Allenâ€™s Cay a busy place. During our stay, the anchorage, which was actually a channel that flowing between Allenâ€™s and Leaf Cay, was packed with sailboats. Jet skis zoomed around the perimeter past the shores of the islands and back to oversized party boats parked for the afternoon. Large speedboats, packed, standing room only with 30 to 40 bathing suit clad tourists from Nassau came twice a day for a 20 minute gander at the prehistoric reptiles. 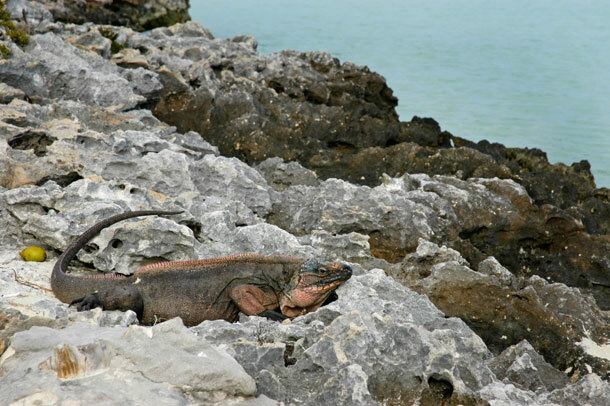 We spent a day and a half exploring the three cays and snapping pics of the often shy, but sometimes posturing iguanas before we decided to leave the carnival behind and head on down the water trail to quieter spots. 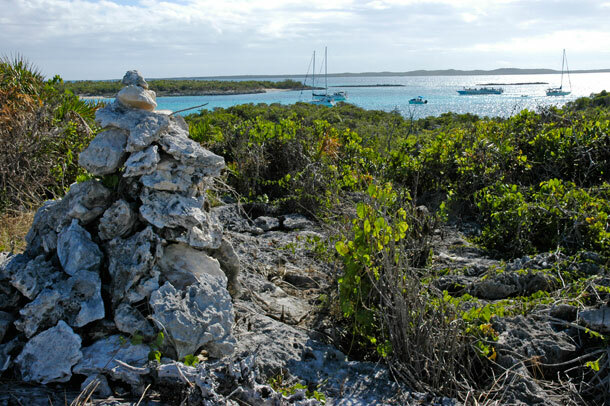 A Cairn on top of Allen’s Cay. In the distance you can see a speed boat full of tourist from Nassau enter the anchorage. 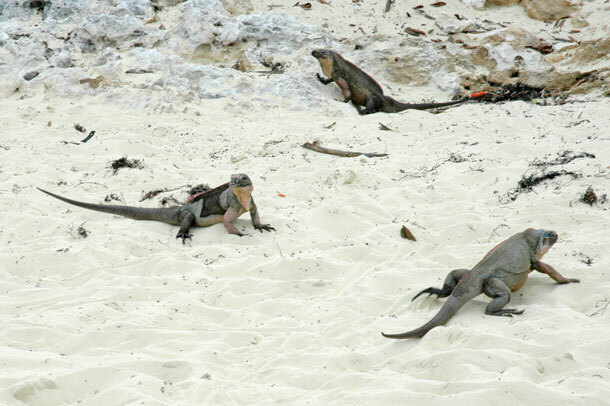 Iguanas gather on the main beach on Leaf Cay. 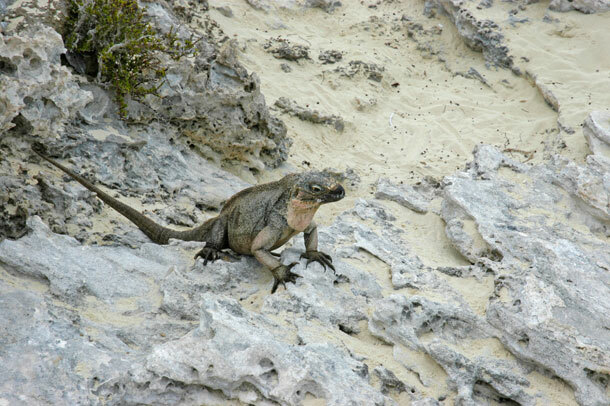 The iguanas on this beach are somewhat more adventurous and less afraid of people than their siblings on the other beaches. No doubt in the past tourists have lured them out with food and they still expect a treat although signs on the Cay request that they not be fed. This guy would let me take a few pics until I got too close, then he would crawl back into the bushes. According to wikipedia, only 1000 of these endangered animals found in the wild. 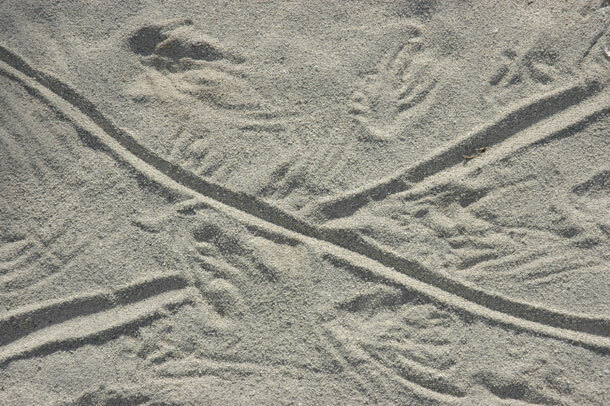 The trails of an iguana crossroads. 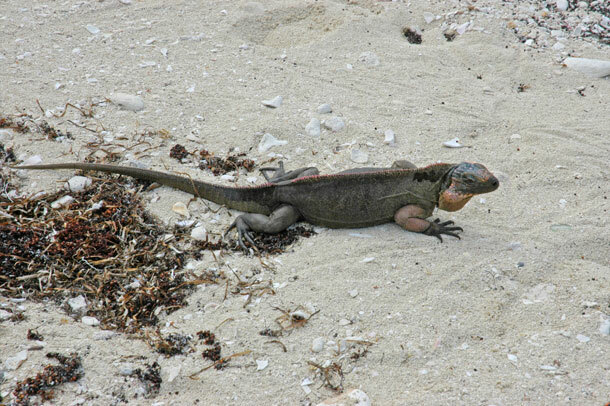 SW Allen’s Cay was my favorite beach to see iguanas. 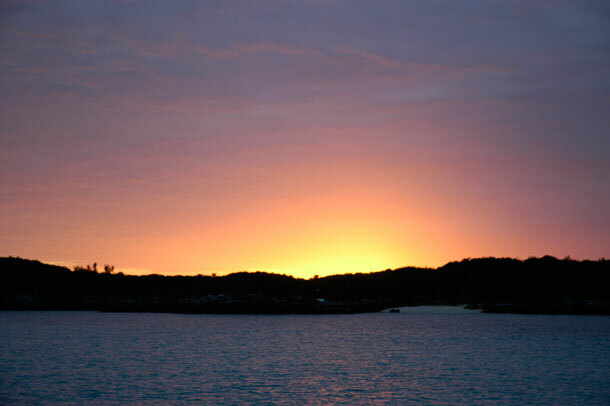 It is strikingly beautiful and far enough away from the main beach, it seems to be less visited. The iguana on the left in the photo posed for me for a long time.